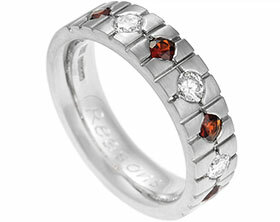 Nicky wished to commission a delicate fitted wedding ring that combined a red stone. 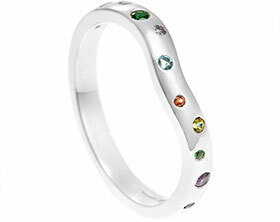 The 2mm wide band has a gentle d shape profile and follows the beautiful curves her engagement ring. 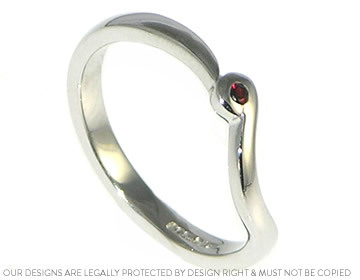 On the left hand side a 1.5mm brilliant cut garnet has been set within a tiny curl ccreated by the band itself rather than a separate setting. To finish the 9ct white gold has been rhodium plated and polished. Palladium engagement and wedding ring set. 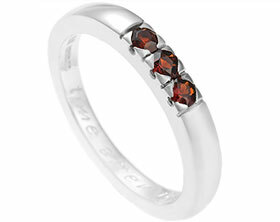 Pair of matching 9ct rose and white gold wedding bands with garnets. 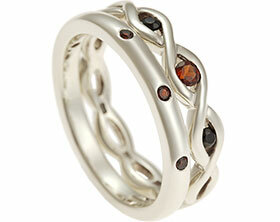 Pair of commissioned white and rose gold wedding bands with garnet and diamonds.